Wednesday July 14th 1920 Edith was ironing and Vene busy with other things. I crotcheted and slept in afternoon. I did not feel well. Had letter from Winnie Lourence. I wrote to her and Hattie. Thursday July 15th 1920 The folks ironing. I crotcheted what time I cared to. Rested in afternoon. We spent evenings on the porch. Friday July 16th 1920 The Websters come out from Peoria at 8.30. Edith went up town and I sent for some medicine. I crotcheted some wrote card to Hattie. Mr Parsons here in afternoon. The Websters home at 4.56. We spent evening on porch. I got my papers from home. Saturday July 17th 1920 The folks had a busy day with finishing the ironing, doing baking &c. Edith up town in forenoon. An interesting letter from Laura. I had letter from Hattie with one enclosed from LeGrand. Birdie and Rob. I slept in afternoon and after supper Edith and I walked up town. Sunday July 18th 1920 Edith went to church. I read some in forenoon. Slept part of afternoon and we sat on the porch all evening. 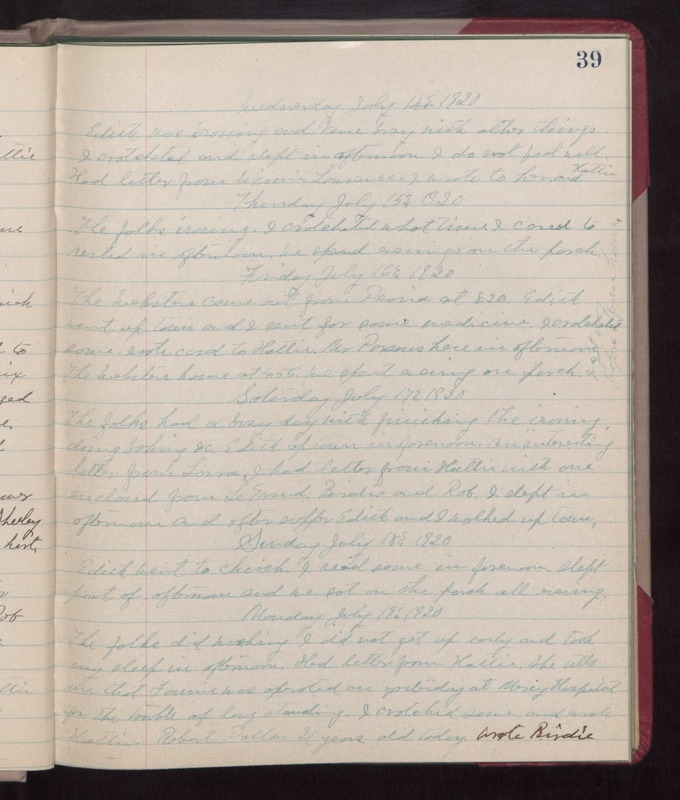 Monday July 19th 1920 The folks did washing. I did not get up early and took my sleep in afternoon. Had letter from Hattie. She tells me that Fannie was operated on yesterday at Mercy Hospital for the trouble of long standing. I crotcheted some and wrote Hattie. Robert Patton 21 years old today. Wrote Birdie.